I saw this and thought it was the missing response to the tweets in your post on taxes. The math goal was to give kids deeper experience of piecewise-defined functions (and the function concept in general); the civic goal was to help them understand the primary mechanism by which our government is funded. Students came up with wild, awesome stuff. Some gave negative MTRs (basically recreating the earned income tax credit); some gave MTRs above 100%; one precocious kid (who already knew calculus) gave MTRs that varied continuously with income, thereby requiring integration to compute your tax owed. I am stealing, erm, I mean “borrowing”, this for my Precalculus class. Thanks for the awesome idea Ben! this is great. going to steal and adapt a bit for my prob/stats class. It is probably interesting to note that the current MTR does vary continuously with income level. If we figure out total federal income tax owed (based of the MTR tax table) and divide by gross income, then the percent of income paid towards federal income tax does continuously change even within a given marginal rate. Very interesting stuff. And complicated! So many unintended consequences from messing with tax rates. It’s funny — I didn’t think any of this was controversial until I read your follow-up message about the controversies. It seems to me that your scope was too limited. IMO, all teachers are responsible for teaching critical reading and critical thinking about validating or debunking claims that cannot be backed up by evidence and sensible reasoning. I don’t know why this would be limited to Statistics teachers. I was just thinking, the next topic when we come back from exam week is piecewise functions, so I should definitely be able to work this into my Algebra 1 class. So I also hace to think on these details. The marginal tax rate issue seems more like a math type of thing as others have pointed out. What is the statistics angle? Interpreting the YouGov poll and commentary analytically (and skeptically) seems more appropriate for a statistics class. Q: Is there non-anecdotal evidence on the accuracy of tax policy statements from party leaders? Q: If there really is a difference in understanding of marginal tax rates between parties, are there other possible explanations for this difference? Association vs Causation and all that. The YouGov article talks about this a little bit. Somewhat related is this article detailing the actual vs estimated vs preferred wealth distribution. The differences between subgroups is far smaller than the difference between perception and reality. I love the additional resources popping up in the comments that explore the idea in depth. Here’s a really great, simplified one, that made me think of @gfletchy’s progressions videos. Interestingly enough, the mathematics of these brackets is maybe a weighted average kind of task, but it’s also middle school appropriate. How much time do we spend getting ready to do other things in high school but run out of time in all of secondary school to do important things like this? Only two problems with your title: It’s not just statistics teachers and it’s not just this year. But, this is a good place to start. Thanks for saying it. I will admit that when I do lessons like this, I worry about being too political. But, I have many social science friends and they have discussions about these topics all the time. They have given me good ways to frame questions to make all students feel that they can contribute and lead to a robust discussion. The MPS ask us to have students “communicate and critique the reasoning of others.” It does not just have to be about how to add a fraction or the trend free throw points in a basketball game. For example, we can look at climate change data and we have to conclude that it is changing. We can have opinions about what to do about that: decrease carbon use, or just build dams, etc, but the numbers tell us the climate is changing. Our colleagues in other disciplines can help us feel comfortable about approaching these lessons. Crowd sourcing is frequently used in economics when forecasts are conflicting or disputed. There must be some reason why virtually all developed nations reduced their tax cuts on the wealthy over three decades following the early 1970s. Were all nations, including all of Scandinavia, badly mistaken in choosing to hugely reduce tax rates on the wealthy? For example, lot’s of bad things happened in Sweden in the 1960s and 1970s when the Swedes were trying to confiscate almost everything from it’s highest income earners. Thanks for the comment. The US had a 90% top tax rate during the Eisenhower administration, which corresponded to a period of high growth and low income inequality. 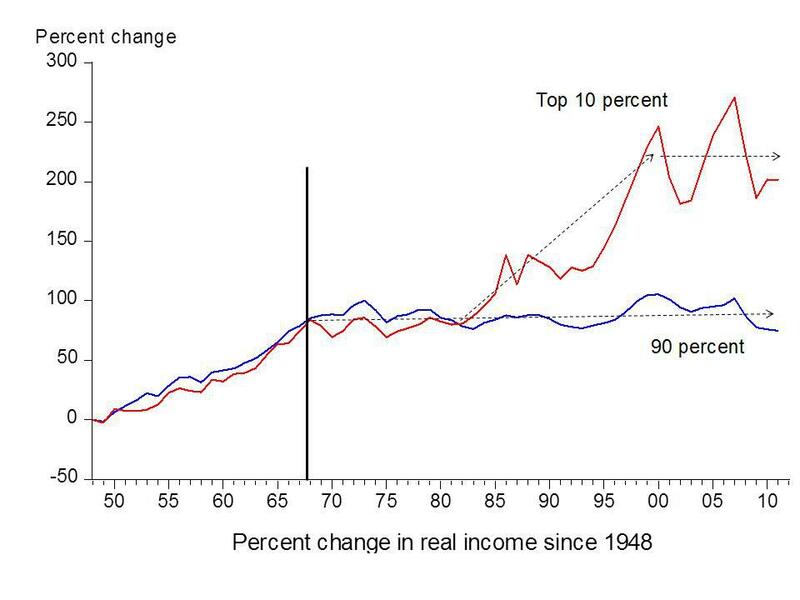 Since the tax cuts in the Reagan years, income inequality has expanded at an alarming rate. Personally, I would take the budgetary policies of any Scandinavian nations over ours right now and I’m happy to chat more about it. However this post is meant to illustrate how hard it is to have even this particular conversation when lies about how taxes work go unchallenged. I’m hopeful math teachers will do more here. The Nordic Tax marginal tax rates are not all that much higher than the USA tax rates if you factor medical insurance costs, transportation, and other benefits the Nordics get for their taxes and we pay for on top of tax rates. What you’re saying is that you’re right and virtually all the other developed nations of the world were wrong in reducing the rates for highest income people 1970-2005. I don’t think so. The Swedes are Exhibit A on what goes wrong with high marginal tax rates. One thing to note about Scandinavian tax rates: they are much flatter. Their top tier starts at about 1.5 times the average income. Here in US the top tier doesn’t apply until you make 8 times the average income. That is a big reason why the top tier rates appear “lower.” The similar tier for U.S. under the new 2019 rates would be 24% for income over $84,200 which is bout half what Nordic countries. Now THERE’s an interesting problem, accurately compare rates for countries with different brackets–both with and without healthcare/higher-ed/parental leave/tattoo removal (Simpson’s reference). If the Nordics have the best tax systems then why did literally all Scandinavian nations reduce their highest marginal rates so dramatically? I’m not arguing they’re the best, I’m arguing that your argument is a lousy argument. I mean … I’m not saying I’m right. There are plenty of economists who identify the neoliberal turn of the 1980s as responsible for the extraordinary inequality around the world and poor quality of life in the US. Just because the whole world ( probably debatable IMO) has done a thing, doesn’t mean it was the right thing to do, particularly given the results. Given: All countries with tax rates that are too high will lower them. Prove: The US should not raise their top tier tax rates. Nordic countries had a top marginal rate that was too high. If the US raised their top tier marginal tax rate, the rate would be too high. The US rate would be higher than the rate of the Nordic countries, which are too high. US should not raise their top tier marginal rate. P.S. I’m in the middle of a unit on proof writing, so I’m hypersensitive to the formulation of arguments. My wife told me she loved me this morning and I didn’t believe it because there was a flaw in her argument. So don’t take this as a personal attack, just some recreational fun that caries a high price when held up against our social constructs. P.P.S. This “proof” might be misrepresenting your reasoning, feel free to revise. This conversation has run its course and is probably chasing off folks interested in other conversations. I hope you two can find each other somewhere else on social media and I look forward to hearing one day about what you both resolved. I would like to learn so much more about this! I find it very interesting! I’m also enjoying reading some the emotional comments! I’m more or less a republican, but I don’t get offended very easy…and I’m technically considered a millennial. Can anyone direct me to a TED talk or reliable source that can teach me more about tax rates? I would really like to teach this, but I feel like I know so little! I thought millennials were supposed to know how to use Google, Brock! I’m an old soul! I prefer to ask questions first, Google later. The math is great. I always love the math. The politics, not so much. If we bring politics into the class we need to challenge existing paradigms, many of them – not just one of them. If we believe we are in a bifurcated political world – we need to challenge both “forks”. There are great opportunists to challenge many beliefs and paradigms through this type of problem – read on. Another fair question to ask is, “Why would someone want to turn a $10,000,000 company employing 50 people into a $50,000,000 employing 250 people (creating 200 more jobs) if they will automatically lose 70% of their profit? We could go on to ask the kids to calculate how the additional tax would / could be added to the price of the product / service. Ask the kids about the costs of doing business (e.g., labor, rent, equipment, tax bill…). There are arguments that math can tell that says taxes are just another cost of doing business. There are other math stories that show taxes as being completely different and NOT a true cost of doing business since it is only applied AFTER the profit has been determined. It just depends on how the tax is implemented. As you can see, lots of good math here but if paint this with one dimensional brush strokes we will turn a lot of people off and lose influence. Mike, if it were possible to like comments on this blog, I would like yours. In fact, I would create multiple accounts so that I could like it multiple times. I think the politics should be brought in. Math is a tool to talk about the issues, and important issues are by definition a part of politics. Teachers (and politicians) should lay both sides on the table. When only one side of the story is cast, most arguments are convincing. …But nothing is ever that simple. Thank you. My reaction in clicking on various student comments was: there is so much misunderstanding, where does the teacher start? For example, in a graph about market caps of companies compared to Apple, the kids were mostly way off target (understandably so). Common: no idea what market cap was….the most common comments implied that Bank of America actually had its $321 billion of cash, for example (“how do they spend it?”). I think of your other blog – try to deal with student mistakes differently, try to start with the question they are correctly answering. But often you can use that technique in a few seconds, productively. So I wonder how to start a conversation being swept up in the needed background knowledge which might take several minutes, expanding constantly with relevant student questions, whereby the lesson never really gets back to the graph at hand….